Long Term Rentals: 30+ day rental discounts available. Please call to discuss. Delivery to Campsite Available (Fee Extra): Contact us for details at 1-844-760-0004 or Email Us. Rental Insurance ($20/night) is required for non BC Residents. BC Residents must provide proof of insurance. Are you a BC resident? A refundable booking/security deposit of $750.00 (CDN) will be taken at the time of the booking. Full payment must be made 30 days in advance of rental pickup. The deposit will be held for insurance deductible, damage, missing items or if unit is not returned clean, etc. Any unused portion will be refunded within 7 days after rental return. A copy of a credit card will be held on file to cover any amounts owing that are over and above the $750 deposit. The renter is responsible for all traffic violations and parking tickets. $200 will be held for 30 days after return of unit in case of violation/parking tickets or toll charges. Check in time is 3:00 pm: we will do our best to have your unit delivered and set up as soon as possible on your site. Check out time is 10:00 am: this gives us time to service and move the unit. No refunds for early return or check out. We ask that you call the day before your pick­up to book a pick­up appointment. Please allow 1 hour for orientation. Please advise us of your return time so that a representative is available to meet you. B.C. Residents With A B.C. Driver's License: BC residents with Road Star or Road Side Plus Package through ICBC are covered for rental insurance of the motorhome for rentals of 30 days or less. We require proof of insurance, plate number and registered owner. The contract will be made with the registered owner for coverage to take effect. All other BC residents will be required to purchase rental vehicle insurance available through any agency at a cost of $10 per day. The renter agrees that any and all damage occurring while in the renter’s possession will be claimed through their ICBC Policy. Any extra charges arising from such damage and not paid by ICBC will be paid by the renter and charged to their credit card. There is a mandatory fee of $20 per day for insurance. The renter agrees that any and all damage occurring while in the renter's possession not covered by ICBC will be paid by the renter and charged to their credit card. Any accident, damage to vehicle, vandalism, fire or theft, must be reported to RV Rentals Kelowna and the Police within 24 hours of occurrence, otherwise the insurance becomes null and void. An administration fee of $100 will be applied for every occurrence. The renter acknowledges the possibility of a mechanical failure or breakdown, and recognizes that such occurrence is an inherent risk associated with the operation of a recreational vehicle and beyond the control of RV Rentals Kelowna. 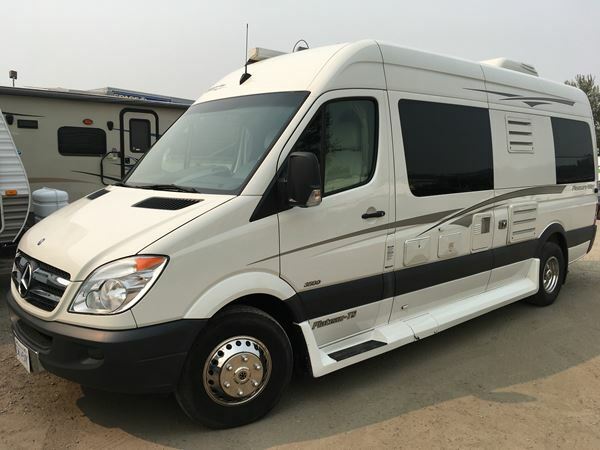 The renter agrees to hold RV Rentals Kelowna harmless from and against any loss of time, transportation costs, inconvenience, food loss in vehicle, and any and all expenses resulting from such failure or breakdown. A complete inventory list will be available in the RV and an inventory count will be completed at time of checkout. Please ensure all dishes and utensils are washed and put away. Please wipe down the following with the disinfectant supplied: all sinks, counters, table tops, appliances and tubs/shower stalls. Floors are to be swept & washed and the inside of the fridge, stove and microwave wiped clean. RVs must be returned clean and undamaged on the outside as well as the inside when it is returned. A $100 cleaning charge will apply if the RV is not clean upon return. An additional cleaning fee may be accessed if the unit is returned extremely dirty. If the smell of smoke is detected upon return, a $500 defuming charge will apply. Awnings damage easily and are the full responsibility of the renter. Awnings must be retracted in windy conditions and drained properly of water (lower one corner). The Awning Manufacturers recommend awnings be retracted in windy conditions and/or during rain and will not warranty awnings for wind or rain damage. Ensure that awnings are raised high enough over the entrance door so rubbing does not occur. Insurance deductible is $300.00 per occurrence. Prevent responsibility by retracting/closing awning in the upright position. The Fridge must be LEVEL while Motorhome is STATIONARY. Air Bubble in Level (in bottom of freezer) must touch the inner ring. Slide(s) MUST be closed on all RVs prior to moving the RV any distance. Renter will be responsible for any damages that occur due to not retracting the slide(s) prior to moving. Use water sparingly as the fresh water tanks are limited in size. One tank of fresh water will need to be filled. Waste tanks may need to be emptied prior to your return date and are the renters responsibility. (many camp areas have a septic business who will come to you). Where holding tanks are not emptied upon return/checkout, a $50 emptying fee will be charged. Use lights sparingly, as 12 volt battery power is limited. 120 volt plug in power or a generator is required for air-­conditioning, microwave, coffee maker, toaster etc. Note: Some motorhomes have generators. 1 hour of generator use per day is included in the motorhome rental. $5/hour will be charged beyond the allotted time limit. Renter is responsible for all fuel used by the generator. Generators can be rented for $20/day. Motorhomes receive a travel allowance of 150km/day. Additional mileage will be charged at $0.37/km. Vehicles are not permitted to enter Mexico at any time. Travel to Death Valley is limited to the low season. Motorhomes are not allowed on any dirt/gravel roads (other than campground roads) or roads designated as ‘other roads according to official Provincial or State maps. All drivers must possess a valid drivers license for the entire rental period. Minimum age is 25 years old. Only drivers listed on the contract are allowed to drive. A special license is not required. Checking coolant and engine oil levels at each refueling. Receiving authorization before any major repairs. The renter may be held responsible for mechanical damage due to negligence in operation and/or not performing normal maintenance. Retain parts and receipts for items replaced by a repair shop in order to be refunded. Renter may make any reasonable maintenance purchases under $100 without permission. (e.g. windshield wiper replacement, oil, antifreeze, wiper fluid). Renter will be reimbursed upon return and a receipt is provided. The renter is responsible for the cost of all fuels, such as gas, and propane, during the rental period and must ensure that all levels are topped up before returning the Motorhome. $50 + cost of gas or propane will be charged if not returned full. The renter will be held responsible for any damage due to negligence in the operation and/or regular maintenance of the vehicle. Checking tire pressure, lug nuts (wheel nuts), engine oil, fluids and coolant levels at each refueling. Damage caused by driving under the influence of alcohol or drugs. Damage caused to the engine due to failure to use specified fuel. Damage or repairs due to travel on restricted areas. Damage due to failure to maintain fluid levels. Tires and wheels damaged by hitting road hazards or objects on the road. Damage caused by the freezing of vehicle’s systems. Deliberate or willful damage by any member of the group or any guest. Damage occurring while the vehicle is operated by anyone under 25 years or over 75 years or not licensed. Damage or injury while the vehicle has more passengers than seat belts. Damage or injury to the occupants of the vehicle, under no circumstances, are covered by the insurance. Damage or injury while the vehicle is used for the transportation of contraband of for illegal trade. Renter always pays all costs for losses not covered by insurance such as towing and flat tire.. The Renter understands nonpayment of any outstanding fees, costs of damages or invoices issued to the Renter from RV Rentals may lead to a negative impact on its credit, and the Renter will also be responsible for all attorneys’ fees and costs in collecting the amounts. This Agreement is governed by the law in force in the Province of British Columbia and the Renter and RVR Kelowna irrevocably submit to the jurisdiction of the courts of the Province of British Columbia. Any extension of the rental date must have prior approval of RVR Kelowna. Failure to comply may result in the unit being reported to the authorities as stolen. The renter hereby acknowledges having read the terms and conditions set forth on the attached document and hereby accepts delivery of the above described vehicle and equipment. To receive full refund of damage deposit, the Renter must return the vehicle full of gas, full of propane, sewage tanks empty and rinsed, vehicle cleaned and undamaged on the inside and outside to RVR Kelowna’s satisfaction. Renter will pay for all fuel used. No refunds for early returns. Renter’s signature on this agreement will be considered authorization to charge renters credit card for any charges over and above the damage deposit. The vehicle is delivered to the renter in good operating condition. The Renter agrees to return the vehicle in the same condition in which it was received, except for ordinary wear and tear to the vehicle’s premises on or before the date specified. The Renter shall be shown the proper operation of the vehicle and its equipment prior to leaving and the Renter agrees to and acknowledges the proper use and operation of the vehicle and its equipment prior to leaving. RVR Kelowna shall not be responsible for loss of damage to any property of the Renter or any other person which may have been in or on the vehicle either before or after the return of the vehicle to RVR Kelowna. The Renter shall assume risk of such loss of damage and waive all claims therefore against RVR Kelowna and defend indemnify and hold RVR Kelowna harmless from any and all claims arising out of such loss of damage. By paying the initial deposit, renter declares that they have read all of the above and agrees to all these conditions.